Hello readers (: and welcome to my blog. In my blog, World of Cetaceans – Whales and Dolphins, I strive to bring you readers amazing knowledge of these magnificent, elegant, and brilliant creatures of the sea. And at the same time, draw your attention to several anthropogenic activities that are currently interfering with the lives of these sea inhabitants. 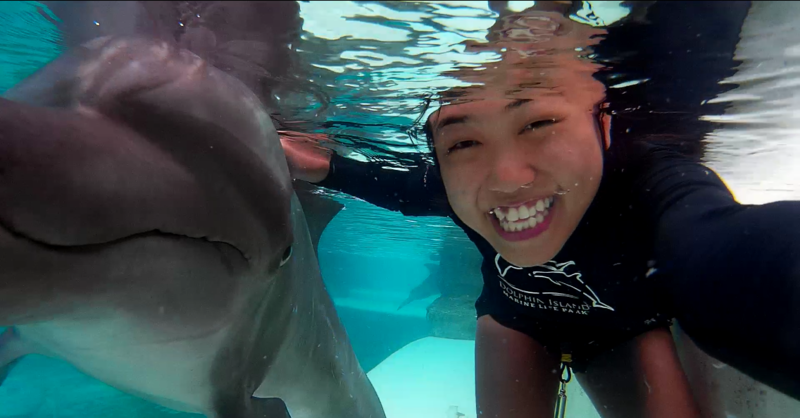 I am Theodora, and my passion for these cetaceans was developed when I was working with Indo-pacific Bottlenose Dolphins for a period of 10 months in my gap year. As an assistant marine mammal specialist, I had received so many valuable lessons that cannot be obtained through any kind of books or videos. Indeed, those dolphins were my greatest teachers, in teaching me to respect, appreciate, and connect to them in a very special and intimate way. I was assigned to be on Shiye’s team in March 2015. Shiye is currently about 10 years old, and one of the youngest boys in Dolphin Island. The meaning of Shiye’s name is ‘wise councillor”. There is no doubt that I believe Shiye is one of the smartest dolphins, with the cheekiest, curious and most energetic personality. Every dolphin has a unique personality, and is extremely precious to every one of us who have been working alongside them. I hope to share my passion for these animals through my personal experience, and perhaps ignite the same for you too!